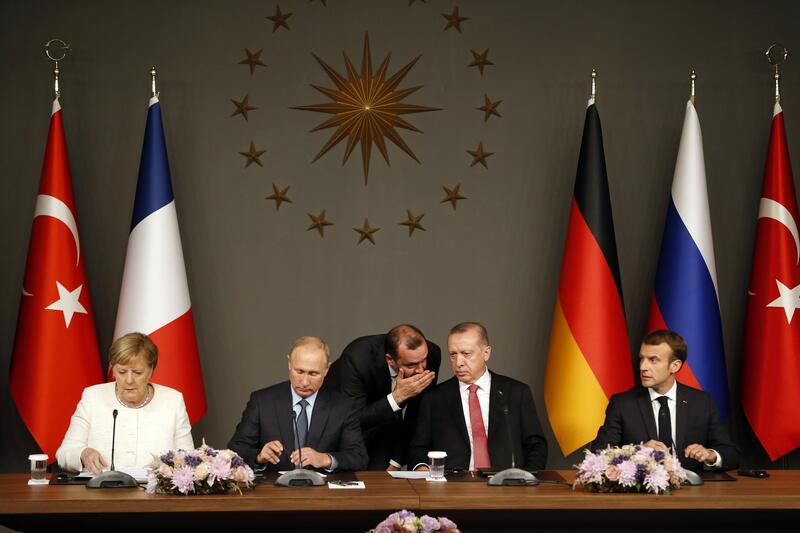 The leaders of Turkey, Russia, France and Germany discussed the war in Syria at a summit , reaffirms its call for a United Nations-sponsored political process to end the war, which has claimed hundreds of thousands of lives. A final statement by the four leaders also called for the convening of a committee by the end of the year to work on constitutional reform as a prelude to free and fair elections in Syria. It also supports efforts to facilitate the "safe and voluntary" return of refugees to their Syrian homes. The statement also rejects "separatist agendas aimed at undermining Syria's sovereignty and territorial integrity as well as the national security of neighboring countries." Many obstacles to a peace agreement remain. They contain split views on Syrian President Bashar Assad, who is supported by Russia and Iran. Western countries condemn Assad for indiscriminate attacks on civilians, and Turkey helps insurgents remove him from power. The leaders of Turkey, Russia, France and Germany hold a summit in Istanbul to discuss security and humanitarian and political issues in Syria, in hopes of one of war years devastated country lay the foundation for peace. The Leaders' Assembly on Saturday afternoon is to promote the maintenance of a ceasefire in Syria's northwestern Idlib province. The agreement prevented a Syrian government offensive in the last rebel stronghold last month, which many feared would have triggered another refugee crisis. Turkish President Recep Tayyip Erdogan welcomes Russian President Vladimir Putin, German Chancellor Angela Merkel and French President Emmanuel Macron.